Three of Nashville’s most dynamic female-fronted acts joined forces Sunday for a special Lightning 100 Sunday Night broadcast live from 3rd and Lindsley. Returning home from their west coast tour, Those Darlins invited established local Tristen and quickly rising newcomer Adia Victoria to perform on a triple bill that gave a solid sampling of the diverse Nashville rock scene. Her set was short but potent, including new tracks like “Taste of You” and “Sea of Sand” as well as her debut single “Stuck in the South.” At one point, Victoria sang, “All I ever really wanted was a story.” Judging by her sharp songwriting, instinctual knack for a blues hook and fiery, commanding stage presence, Victoria’s is a success story soon to be written. 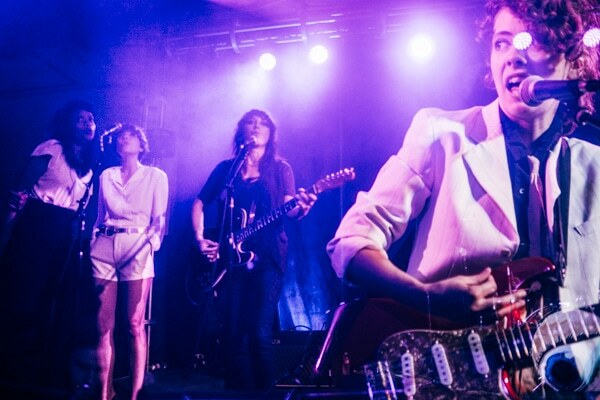 It was a welcome homecoming for Those Darlins, who have had a hell of a year touring in support of 2013’s Blur the Line. They played several tracks from that album, including “In the Wilderness” and “Oh God,” as well as crowd favorites like 2009’s “Red Light Love” and 2011’s “Be Your Bro.” A highlight of the set was a cover of The Crystals’ 1963 hit “Then He Kissed Me” with Victoria and Tristen, which was delivered with the same tongue-in-cheek swagger that catapulted the band from local mainstays to nationwide touring act. The evening closed with everyone on stage together once again, this time for an extended take on the Darlins’ “That Man” (from Blur the Line) that ended with lead singer Jessi Zazu playing guitar out in the crowd. It’s rare and refreshing for a rock show to have a bill featuring three female-fronted acts, and for a city whose most recognizable rock exports tend to be men, hopefully this is a sign of similar things to come.